You are here: Home / Headlines / Selling Mortgage Notes? Find the Right Note Buyer! Here’s a look at each group including tips for finding and selecting the best note buyer. The institutional investor will purchase notes on a national basis with their own funds. They might hold for long investment or later securitize on the secondary market. These are the “big boys” of the industry with the ability to write the check at closing. They do not usually contact a broker or seller if a note fails to pay, unless there is concern over fraud and/or a first payment default. The private investor purchases notes on a smaller scale, usually limited to a certain geographic region. It is a bit harder to find private investors. Often they are cultivated through word of mouth or by networking with local investor groups. These might include doctors, lawyers, real estate investors, and/or self-directed retirement accounts. The fact that a private investor is more likely than an institutional investor to come knocking on your door due to a late or missed payment from the note payer. The sophistication level of the private investor. Are they truly equipped to underwrite, close, and service a note? Whether there is any implied or actual guarantee provided on the performance of the note. Compliance with all aspects of SEC, including restrictions on the solicitation of investors and the offering of unregistered securities. A whole manual could be written on the Securities and Exchange Commission (SEC). Generally, you will be safe from violating the SEC rules if you avoid 1) soliciting investors through advertisement, 2) only sell one note to one investor, and 3) have the investor take ownership of the note and perform all due diligence for themselves. If you choose to play in this arena, please seek competent legal counsel. Another option is to find a note buyer or broker that will act as a mentor. An experienced mentor should have at least seven years of active participation in the cash flow note business. This mentor is sometimes referred to as a master consultant or master broker. They usually buy some notes for their own account and help place others with institutional investment funds. The “master consultant” usually receives compensation through either an upfront mentorship fee or as some split or percentage of the transaction at closing. This group pretends to be investors – but they rarely (if ever) fund a deal themselves. This leads to a daisy chain of note brokers that can make it tough to get deals closed. Unfortunately, most of the online note listing services are overrun by people pretending to be investors. Either deal with the end-user or once removed through a master consultant. Any more hands in the pot will tend to spoil the price and effectiveness. The first step to marketing a note for top dollar is to locate several reliable investors that are preferably end-users. There are several ways to locate an investor with varying degrees of success. or some combination thereof. Maybe that’s how you found us. Might I be frank? That is for rookies. Now if you are a note buyer or note broker, using the Internet can be a great way to find notes for sale. However, it is NOT the best way to find investors to purchase those notes. Why? Because without prior knowledge it is hard to know whether you are dealing with a reputable investor or a poser. We’ve simplified your search by providing our personal Rolodex of investors in the Directory of Owner Financed Note Buyers and Service Providers. This valuable resource has been updated for 2019 and made available in our bookstore! I recommend to anyone who is not familiar with a financial calculator to take Tracy’s course on how to use a financial calculator. Knowing how to use a financial calculator is the cornerstone of anyone looking to purchase notes. Thanks Frank! I’m glad you liked the course and appreciate the positive feedback! I bought your calculator course and thought it to be quite helpful. Here is my question: I am presently active with two fellows who I believe are both master broker/mentor, qualified. Are you also qualified as a master broker/mentor? Hello Rich, Glad you are enjoying the calculator course. We have been buying and selling notes since the 1980’s so definitely have the qualifications you asked about. While we don’t have a formal mentoring program (due to time constraints) we are in the trainings answering questions daily. The Note Buyer directory also lists a variety of master brokers that mentor new brokers and investors. I am selling my car wash business including the building, equipment, and real estate. buyer has credit score of 700. Sell price is 1,225,000.00. 30,000 down. 1,195,000. amortized 25 years at 5.5% with a 5 year balloon. Payment is $7,338.35. I should be closing on this next week. I would like to sell this note. Any suggestions on how to sell this note? What can I expect to get fro this note? i’d be interested in buying notes. are there any available? 1. I bought your starter kit but my password couldn’t get me in right away. I’ll try again. 2. Do I still need to buy something else to do a deal? 3. I didn’t hear my question. Maybe you will email me. Do you buy notes from us? Hello Ron, We are happy to assist. The login to the training is here: https://www.noteinvestingtools.com/login There is a link on that page to reset your password. You don’t need to buy something to do a deal. The key is marketing to find notes. Once you have notes then investors will give you a quote. 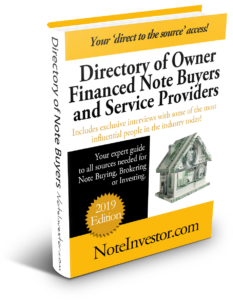 Our training helps you understand the business (both as a broker and as an investor), use proven marketing methods, and view standard documents used during due diligence The Directory of Note Buyers provides a listing of investors that will buy notes from you. We are one of the note buyers listed in the Directory but you have access to many investors. Different investors have different preferences so you will want to work with the best fit for the transaction. I really would like to get back in the note purchasing business but the rule have changed, do you need to be licensed to broker notes. can some answer that question please! Does your directory include Institutional Investors who buy bank notes? If yes, do you know if these investors buy performing and non-performing note pools? The directory contains institutional investors and private note buyers that specialize in owner financed real estate notes. Some of these will also consider bank loans and non-performing on a limited basis. The directory (and all of our bookstore products) come with a 30 day 100% satisfaction guarantee. How many investors are included in the directory? Does the directory include institutional investors? Are investors segregated by buying interest, i.e., NP and Performing and pools? There are 36 investor listings and 12 service provider listings in the 2011 edition of the Note Buyer’s Directory. It includes institutional investors, private investors and master consultants. The listings are alphabetical with a description of their preferences under each listing.